February is upon us, a month of ice and snow in many parts of the country. The Earth is beginning to stir from Her long winter’s sleep, but there are still many days ahead of us before true Spring arrives. Happily Valentine’s Day arrives in the middle of this dreary month and gives us a reason to celebrate and rejoice in the joys of love and friendship. Here’s a quick and easy magickal craft project that you can do to bring or strengthen the bonds that you have with your loved ones and friends. These pretty little heart sachets make great gifts for Valentine’s Day and are a wonderful reminder to keep love in your life and in your heart. Gather together all ingredients. 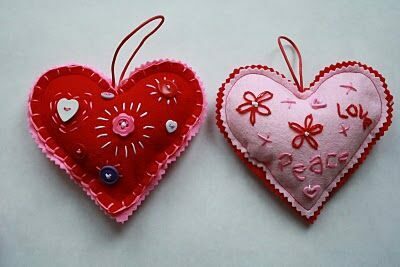 Trace a heart pattern on a piece of paper and then cut out two heart shapes in felt. Put your chosen herbs and crystals in a dish and sprinkle them with your chosen essential oil. Be generous, you want the scent to be quite strong. Embellish one of the pieces with lace, buttons, embroidery etc. With thread sew together the two heart pieces leaving an opening for the stuffing. Stuff firmly and sew the opening together. With each stitch, set your intention of love and friendship. You may want to chant or sing love songs as you sew. Fold the ribbon in half and attach it to the top center of the heart to make a loop.